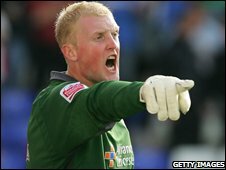 Luton Town have completed the signing of Leicester City goalkeeper Conrad Logan on a six-month loan deal. The 22-year-old spent last season on loan at Stockport County and helped them gain promotion to League One. Logan has had limited opportunities at Leicester and is keen to experience more first-team football. "His experience will be a terrific asset to our ever-strengthening squad," Luton manager Mick Harford told the club's website. Logan signed pro-forms at Leicester in 2003 and recently signed a new deal keeping him at the League One club until 2010. The keeper, who has not featured for the Foxes this season, will remain at Luton until January. Luton have also announced that Richard Jackson has left the club by mutual consent.